This year, almost 40 Romanian cities will see the fourth edition of the March for Life, the biggest yet both in participation and reach. This year’s theme is “Adoption, the noble choice”, promoting adoption, as the natural solution to protect children born by mothers in difficulty, whose families cannot assume the responsibility of raising a child. “We have established this association because we wanted to help young women in situations of crisis and offer young people formation for family life. I started doing this on my own when I was only 16 and the results showed me that this is the most important form of social responsibility,” says Alexandra Nadane, President of Studenti pentru Viata Association. This social effervescence was brought about by a real media buzz. Romania’s March for Life has professional video and promos. It was the first time that the event has had a press conference that was transmitted live on an online TV channel which later registered over 150,000 views. After Studenti pentru Viata President Alexandra Nadane appeared on the TV and radio channels of the Romanian Orthodox Church, over ten more cities joined in the event. Many Romanian cities have also organized related events such as pro-life movie screenings, adoptive parents’ support groups, art exhibitions, conferences and roundtables in what has been named as The Pro Life Week. Another premiere is the concert organized in Bucharest after the March for Life, on March 22. Eight Romanian artists will sing for adoption. In the meantime there will be a drawing workshop for kids. 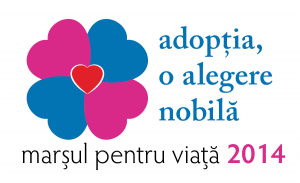 Also remarkable is this year’s official support by Romania’s government, which will help organize a final forum on adoption with representatives of the Romanian Office for Adoptions, members of parliament who have expertise in adoption legislation and civil society. It may prove a turning point for the Romanian practice of adoption. The main proposal made by Studenti pentru Viata Association is that the law provide for the possibility to start adoption proceedings during pregnancy, which is not legal in Romania yet.